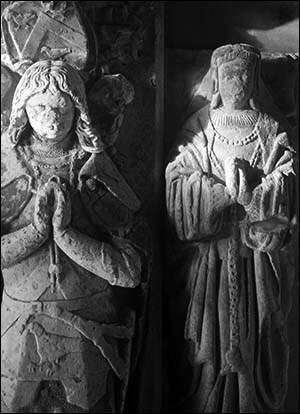 The effigies of Rhys ap Thomas and his wife Lady Janet lie on an ornate tomb chest in St Peter's Church. He was a powerful man in South-west Wales before and after the Battle of Bosworth, where he played a key role in Henry Tudor’s victory. Had Sir Rhys not taken the risk of switching sides, the Tudor dynasty would never have happened and British history would have run a different course. During the Wars of the Roses, Rhys managed to retain his extensive lands. He became chief justice of South Wales. He was not punished when he disobeyed King Richard III’s request to send his young son to the king’s court as a hostage, to ensure he remained loyal to the king. Like many Lancastrian noblemen, Rhys became disaffected by the king’s actions. Rhys and other officers in Wales were supposed to prevent Henry Tudor’s small army from marching to confront the king in 1485, after Henry returned to Pembrokeshire from French exile. Instead, Rhys gathered a large body of men as he travelled through Wales via Brecon to join Henry’s march. Rhys was one of several men credited afterwards with delivering the mortal blow to Richard III. Rhys’ support, before and during the battle, was decisive. He was rewarded with even more property and power in Wales. He was in the thick of the action at flashpoints during King Henry VII’s reign, after which he assisted Henry VIII. Rhys died in 1525 and was buried in the Greyfriars’ church, Carmarthen. His tomb was moved to St Peter’s Church after the friary was dissolved in 1538. His effigy depicts him in armour, with his shield and helmet near his head and a dog at his feet. Lady Janet, Rhys’ second wife, died in 1535. Her effigy lies on a smaller rectangle than Rhys’ effigy, suggesting that it was made for a separate tomb. Around the tomb’s sides are carved figures, some of which date from the tomb’s restoration in the 1860s. There are still some traces of the bright paint which originally decorated the tomb.